Apple and SAP are looking to foster a new breed of enterprise iOS developers by simplifying backend systems integrations and moving business services to the cloud. The head of SAP’s developer initiative with Apple has high aspirations for the partnership and the impact it will have on enterprise mobility. 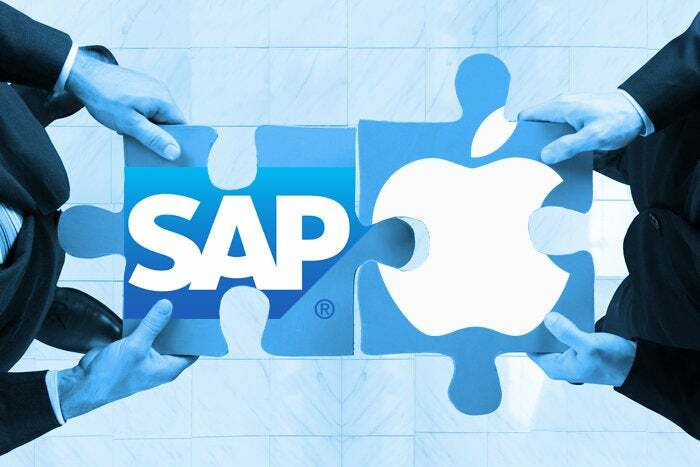 “I believe what’s going to happen with the release of the SDK, and the continued innovation and investment, is that we’re going to create a new enterprise iOS developer,” says Rick Knowles, senior vice president and general manager of the Apple partnership at SAP. “It’s a rare developer that exists, but now we’re going to formalize this role and I believe we’re going to grow a new development community around iOS specifically in the enterprise,” Knowles says. SAP represents the first of Apple’s enterprise partnerships that bring tools directly to developers. Both companies want to simplify the process for developers to integrate their apps with SAP’s massive backend systems of transactional data. The goal, through the release of an SDK and API library, is to transform the amount of information developers can use and call upon in their apps. SAP is pervasive in the enterprise, but the company is committed to becoming more open by making its services more readily available to businesses that don’t deal directly with SAP, according to Knowles. “This is not just for an SAP customer and SAP systems, it is also to be open to allow for connectivity and integration to non-SAP systems,” he says. Instead of coding for SAP integrations, developers can rely on a feature-rich API library that already ties into backend SAP systems. “Everything that we are doing is adding elements on top” of Apple’s iOS and exposing SAP services through the SAP Cloud Platform SDK for iOS, which will be released later this month. “We have a deep engineering collaboration effort to align this,” he says. The initiative shifts developer responsibility to SAP and Apple to make sure backend systems integrations work seamlessly and are regularly updated, according to Knowles. SAP is also matching its development cycle with Apple’s for iOS. The giant in ERP is committed to release updates to the SDK every four months. SAP’s efforts are “all designed to serve a growing community that we believe has to be built to change the usability and user experience in the enterprise,” Knowles says.